Shaun is a sheep with a heart of gold and a love for mischief. He decides to take the day off and have some fun but ends up with more action than he anticipated. Shaun’s hijinks unintentionally lead to the Farmer being taken to the Big City. Now Shaun and The Flock must venture from the farm to the city to rescue the Farmer. 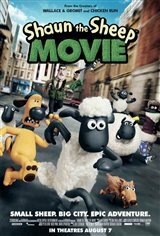 In an adventure full of danger and excitement, Shaun and friends must use teamwork and loads of "wool" power to save the day!